Other Projects life and the Helicopter. My son (Paul A) spent the better part of the last two weeks helping some friends finish the plumbing and fixtures for a static firing. I went out Sunday to wire up some sensors and record data for the event. beyond that I can't talk about it much. All of the stuff Paul A and I were responsible for worked correctly. All the plumbing worked and I logged good data. Both Murphy and Marvin were present at the test. Marvin who??? Marvin the Martian of course, his favorite line "And right about now there should have been an earth shattering Kaboom!" It was nice to see everyone from FAR and work on a project with them. It was also nice as a father, to see skilled, competent, successful adults, impressed by my sons skills and work ethic. Being a father has been a hard job, but its nice to see that my son is starting to learn a lesson that took me at least 10 years longer to learn. Happiness and satisfaction can not be purchased. All too often we think I'll be happy as soon as I buy a new motorcycle,car, house,wardrobe etc... I'll be happy as soon as I'm promoted to manger, VP etc.... I strongly believe that happiness is earned by creating or doing something that has value. The sense of satisfaction earned by accomplishing something hard can not be oversold. I also think that the creation of tangible things with your own hands is of great personal value. You can not purchase this feeling. While I was out at FAR waiting for other parts of the project to come together I flew the helicopter, the GPS finally works correctly in flight! Alas the Compass does not because the GPS antenna has magnets in the bottom and sits above the compass sensor. Arghhhh! I bought a pair of lit blades and some glow wire to give it a try. I'm not the worlds best RC pilot, I can hover nose in, nose out and fly around a little, but not a whole lot more. So I was worried about flying the big trex with 3K worth of electronics on it and crashing it. So I went to the hobby store today and bought some night blades for my little Trex. $45.00 worth of blades seems like a good price to see if I can fly at night. I wired up the glow wire and went out and tried flying it. I flew off three full battery packs in drive way at night, the test was both a success and a bit of fun. So now I have the confidence to be comfortable flying the big trex in an open field at night! My wifes comment "oh thats pretty it matches our Christmas lights, a Christmas copter!" I want to try and give a glimpse of the details involved with some thing as simple as a swapping the GPS. Ive been working with a GARMIN GPS-18 5Hz gps, it has a serial interface that spits out NMEA sentences. NMEA is a standard protocol. If all you want out of the GPS is position then the GPS units are almost interchangeable. They almost all support the NMEA sentence...GPGGA. The simple way to process the NEMA sentence is to load the whole thing into a character buffer and parse it. The Netburner library has a nicely written serial driver that makes talking to the serial port pretty painless. Open the port and read characters from it. The serial driver is intrrupt driven, so if you get busy and don't read characters, nothing is lost. To fit this reading and parsing into the main control loop is as simple as adding code to check to see if GPS chars are available and then jumping to a routine to read and process the chars. You duplicate this three times, GPS, IMU and Telemetry commands. I thought I'd try to unclutter the main task loop and be a little more efficient. I'm the original author of the Netburner serial driver, so modifying things at the driver level was not too scary. I modified the serial driver to parse the GPGGA sentance one charactor at a time in a state machine and then post to a semaphore to tell the main task that new GPS data is ready. This is a nice routine because it spreads the GPS parsing out in time and has the minimum possible delay.When the sentence checksum is validated the data is ready, all of the floating point data fields have already been parsed out. So the main task only gets notified when data is actually ready. After the GPGGA I expanded the system to capture the proprietary garmin PGRMV sentence that gives me north, east and vertical velocity. Again its all clean and works well. The state machine now knows how to parse two sentences and ignore the others. This data is processed by the main data processing task. In addition to using it internally it also sends telemetry frames off on the maxstream radio to be displayed and recorded on the ground. It does not support the garmin PGRMV sentance. 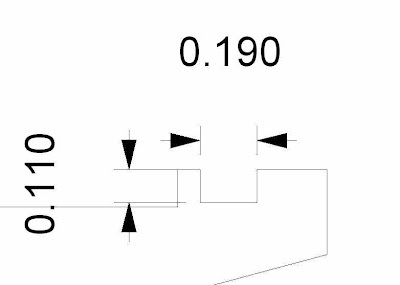 None of its NMEA sentances have vertical velocity. So before I can do any of the software development I need to get the GPS hardware working. I covered most of that in the last post. One minor point I did not mention is that Vector draws 3 times as much current as the garmin and the GPS voltage regulator in the original system overheats, so in addition to fabricating a box I have to rewire the power distribution system on the helicopter....back to the land of software. Humm I really want to know vertical velocity... digging in the crescent vector manual I discover that they have a binary message that has vertical velocity, in fact the single binary message has ALL the GPS data I have been capturing in a single message. The Crescent also has heading capability, alas it only outputs heading in a NMEA sentance, not a binary one. so my parsing state machine needs to process a mixed stream of Binary and NMEA messages. Its not that simple. My state machine resets its state to 0 whenever it sees a '$' beginning of message,but with the GPS sending binary data there is no guarentee that the binary data won't contain a '$' this breaks my state machine, so now the state machine knows if it is parsing a NMEA or binary data set and reacts accordingly. Also note that in a serial stream of chactors 1234.5678 there is no ambiguity on how to interpit the data. In a binary stream its a little bit more complicated. The GPS sends binary data as a IEEE754 double. standard format, but the GPS sends data in littel endian or intel format and the Coldfire processor I'm using uses big endian or Motorola format. (See Endian). SO I have to convert formats before I use the data. This is still a big win, because the endian conversion is much more efficient than parsing ASCII. Note that I'm already doing the endian conversion on the PC display software so this was not unexpected. Once I'm parsing the GPS message the system stops responding reliably to telemetry commands....argghhhh! The problem is that If I keep the telemetry link busy sending data from the helicopter to the ground there is no time for the ground station to send data back. Up to this point the telemetry data stream was not too big for the down link pipe, switching from 5 to 10hz GPS pushes me over the edge. So now I write and debug a telemetry throttling routine that tries to keep the telemetry link idle for 50% of the time by throwing away data based on its age and priority. All seems to be working except none of my telemetry frames have a spot for the GPS heading information, I'd like to keep both the GPS and IMU heading data, so I add a new GPS heading frame type to both the helicopter and the display software. Both areas are pretty modular so this is an easy fix. I label the new data with the same data type tag as the IMU heading data.... .
without remembering that the IMU heading is not floating point but a 0->65536 binary heading. 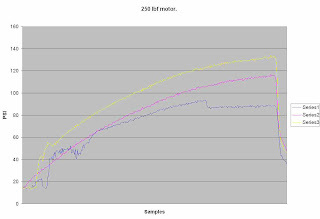 (I worte the IMU parser and display code framework for my air lander over a year a go and have not really modifed it) Hence the GPS heading display is all messed up on the PC so I spend some time debugging the helicopter code to try and figure out why my parser is not properly parsing the GPS heading, only to eventually discover its a problem on the PC side. I really enjoy reading technical blog posts that give you a sense of the problems and struggles involved with building hardware. In an Ideal world I'd like to cover all of the project in this much detail. The reality of time and the need to sleep conspire against this. I've never been a skilled word smith so writing this saga took 25% as much time as struggling through the code. I don't have the patience to document everything to this level, but I'm going to try and do more posts at this level of detail. I've been experimenting with a Crescent Vector GPS from Hemisphere GPS. It uses two antennas 1/2 meter apart to gove heading as well as GPS position at 10Hz. The only problem is that the helicopter test bed (and the rocket) is an electrically noisy place. So I built an adapter module that has an isolated DC-DC converter, a logic isolator and RS-232 level converters on a small PCB. I then needed to mount the whole thing in some kind of shielded enclosure. I've been reading the "Jack Crossfire blog" about the trials and tribulations of making a autonomous UAV helicopter. 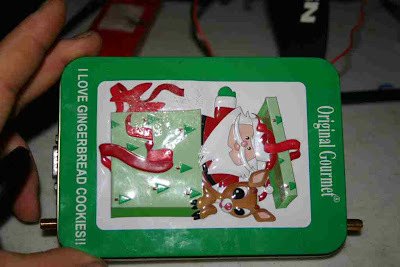 He used an altoids tin to shield his GPS, I'm using a gingerbread cookie tin. (Altoids was too small for the vector). And finally a picture of the carbon fiber frame that mounts to the helicopter and holds the two GPS antennas. I should be ready to fly this contraption tonight, but Southern California are in the midst of a big rain storm and thats not conducive to flying the helicopter. Helicopter testing an a new notional vehicle. I reviewd the telemetry from the last helicopter flight and I think I have finally resolved all my issues with telemetry and hardware. No glitches in either control or data , my telemetry logger logged correctly to SD media so I will never again loose telemetry data from a failure to save, or a dead laptop battery. I got no GPS data, but it's probably because I did not give ehough time for the GPS to lock prior to flight and it did not acquire in the high vib helicopter environement. 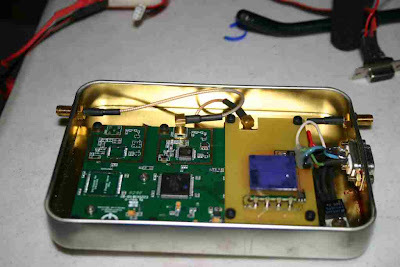 I'm planning to swith GPS receivers before the next flight in any case. A new notional vehicle. And a plan forward. 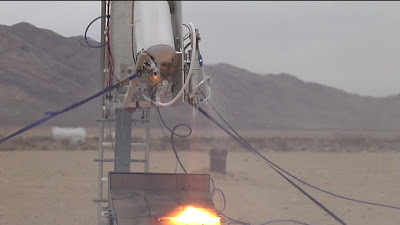 Are our rocket motors really robust for multiple firings and throttling? We have fired multiple times for long runs within an hour, we have throttled, but we have also had failures. We need to run the motor through several simulated missions. 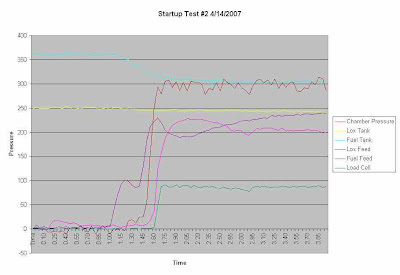 That is follow the LLC flight throttle profile and restart in less than 1/2 hour. Until we have done that several times we do not know if we have a workable design or not. If our motors work then we will probably continue with a 4 motor vehicle. If they do not we will probably develop a single larger motor. The notional design for the vehicle branches on that question. Assuming we have a working motor the the current notional design is as shown above. The key is that the weight is supported by a simple pad under the tank and the landing gear only keeps the vehicle from tipping over. If the motors don't work then we are probably going to build a single engine vehicle with spherical tanks. There are really only two configurations that seem to make sens, the Quad and the Pixel design. Pixel has balance feed problems, but is structurally more efficient. 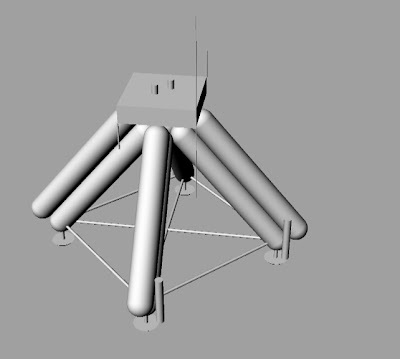 The one drawback I see to the armadillo module design is the mass of the landing gear and the fact that the motor is very close to the ground. I've ordered some hemispheres from AMS industries and they should be here some time in January. I enjoyed visiting with all the people that stopped by to visit at the Xprize cup. 1)Start working on the command and control code on the Helicopter to get the telemetry and mission planning stuff out of the way. This can be done close to home without the major expedition aspects of going out to FAR. Id like to have this 100% resolved by Christmas. Rework the tonegowa driven valves for less backlash and better electronics. (Open servo based?) This is my preference. Use higher pressure Butterfly valves as the sole valve. This is my sons preference. I'd like to have valves resolved by Christmas. 3)Resurrect the test stand even if it means making new tanks and resolving our engine igntion issues once and for all. Before we do any vehicle work I want to run a motor on the test stand with throttling and simulate a full LLC mission including the 30 minute turnaround. I want to do this over and over until we get it right. This may get as involved as developing a new injector and igniter design. I'd like to start this testing in January. 4)Once 1,2,3 are done rebuild the vehicle and start tethered testing. If all goes well I could see tethered testing as soon as Febuary 1 ~ 4 months from now. After watching Armadillo I know I want to make some architectural changes. The primary one will be for the vehicle to automatically test all its valve actuators and sensors with minimal human intervention. When I get to the point of testing a full vehicle I need to find a different transportation method. I'd be inclinded to buy a used flatbed or Box truck, but I can't park that near me, so I'd need to find someplace in San Diego to park it without spending a fortune. Anyone with an empty lot in San Diego where I can park a 20' box truck off and on for a year? I will be leaving for Holloman some time Wednesday afternoon. Before I go I want to wish armadillo the best of luck in their NG-LLC efforts. I will be rooting for them! They have worked very hard and have been a real class act. Good luck to John and the rest of the Armadillo team! it looks 200% better than is did 24 hours ago. being required to do so. " It looks like the witch creek fire is likely going to burn all the way to the coast. Where it crosses I5 and hits the coast is pretty much up in the air. It looks like its going to cross somewhere near our house +/- 5 miles. We live in a fairly dense residential neighborhood, if it gets to us this fire is going to be a truely note worthy disaster. I'm going home from work to join the rest of the family and get prepared to leave. It probably won't be to the coast for another 12-18 hours , but it looks like nothing is going to stop it. Wish us luck, we hope to see all of you this coming weekend at Holloman. I'll let everyone know how it turns out Tuesday. For awhile I've been contemplating making some personal or political posts on this blog. I don't really want to mix the messages that way. Today I started a new blog unreasonableideas with a sad personal note. I'll continue posting rocket stuff here, and I'll post personal stuff there. We will be displaying at XPC. I've been having an internal debate about coming to the Xprize cup as an exhibitor or strictly as an observer. Unlike the other teams that are are looking to raise capital and awareness, we are not yet trying to do that. So I was hesitant to spend the money necessary to transport stuff to the show. I've decided that it would serve my larger goals of showing that small teams and individuals can do significant things in "space development" so we will be there. We will be bringing the complete vehicle minus some valves and plumbing. 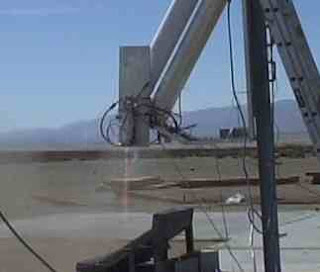 We may also bring the test stand carcass, the test helicopter, and and a video display. If you are coming to the show stop by and say hi. On a personal note I went to the Plaster Blaster event last Saturday and spent the day watching a huge array of people launch rockets of all shapes and sizes. It was my first trip to a high power rocket event. The Xwing (http://rocketdungeon.blogspot.com/2007/10/empire-struck-back-may-x-wing-rip.html)was very cool, but all in all I found the event somewhat depressing. There were several cool projects, but none of the projects seemed to be advancing the state of the art. In some ways it seemed like a conspicuous consumption event. To be fair I saw a lot of families there and that was a very cool aspect to the event. My wife chastised me for this attitude, and said who am I to be judging other peoples efforts. She is probably right. The top side pressurization, regulator and blow off vent valves are all done. 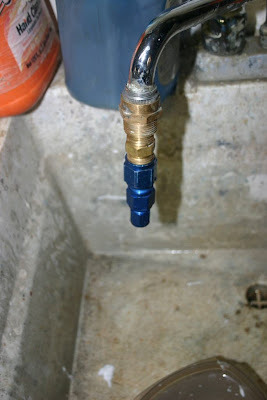 The igniter plumbing is all done. 3 of the four motors are plumbed. The structural framing is all complete. The first cut of the landing gear is done and 3 of 4 are on the vehicle. The new control board electronics have finished initial testing and seem to work. We did some testing with using a normal camp stove propane cylinder as the fuel source for the igniter, and it looks like the tank orifice is too small and it won't feed 4 motors. We will be switching to a paint ball tank for the propane source tank. I've been working on the hardware and have neglected the FAA paperwork side. They are going to put my 120 day clock on hold until I finish up some details I owe them. While I probably don't mention them enough there are a number of people that are helping this project significantly. Charles Pooley has been an invaluable resource to discuss rocket ideas and to bounce ideas off of. The guys at flowmetrics have their shop about 1/2 mile from my house. They have been very helpful with knowledge, know how and ideas. My sons friend Jason. Jason is home from college for the summer and spends considerable time in our garage helping with the electronics, software and the much appreciated shop entropy control. Mark, Kevin and Ted at Friends of amateur rocketry. Bob Nortman has been doing all of our aluminum welding. For the past six months I've been working on this project three days a week, Friday, Saturday and Sunday all day, as well as evenings the rest of this week. This week we are trying to get the whole vehicle ready for a single engine test firing next weekend. To have any chance of doing this I'm taking a week and half off of work and doing nothing but unreasonable Rocket. I fabricated and tested a small dual 1/8" ball valve actuator to replace our unreliable igniter solenoids. I finished the servo mountings on the safety vent valves. My Son Plumbed the pressurization system and with Carl's help at Flowmetrics got the regulator working. My son continued to plumb the vehicle. I put together another "hardware tour" video of the vent and igniter valves. Today we are going to combine a trip to the Los Angles McMaster Carr will call with a trip to see my Father who is recovering from Knee replacement surgery in Long Beach..
We spent a long 16 hour day out at the test site and never got the igniter to light. We had some kind of sludge form in the ethanol tanks and it kept clogging the igniter solenoid and filter. It was a very discouraging day. We test again in two weeks. We have a long list of things to try. 1)Change to isopropyl alcohol for less residue. 2)change to propane for the igniter fuel. 3)Possibly change to a pyro igniter based on a small solid rocket motor. If we do not get reliable ignition and throttling working by the end of that weekend, we are realistically done for this year. The one bright spot was that we were sharing the test facilities with Garvey space and they had a successful test. Seeing a 5K motor running is a beautiful thing. I have some awesome video, and I will post it as soon as I get permission from Garvey. There are 72 days until the contest. Its going to be really busy! I went to the team summit last week and it looks like we did not scare the Airforce too bad ;-). and open instantaneously, when I deliberately added a bit of air before pumping up the hydro tester it sounds like a gun shot when it opens. As I have to prepare pictures and test docs for these valves for the FAA I'll post them here as well. Out of Town this week. I went testing last weekend and have some more video. The testing raised more questions than it answered. I'll be back in town Friday and try to post some of the video and more commentary. I'm away at the freescale technology forum in Orlando. The cool non-rocket news is that the new Netburner product I designed, the Product Kit won the best in show award! One question for the rocket geeks... I'm still having troubles getting the engine reliably lit. Is there any harm to a really long (A second or more) LOX lead? I just got off the phone with the FAA/AST and they have determined that my application is complete enough to begin the evaluation. (This used to be called sufficiently complete) This is the official milestone that starts the 120 day clock. Since the Application they deemed complete enough was received by the FAA on May 29th They are now legislatively bound to approve or disapprove the application by September 26th. They can still ask for a lot of information and request changes in the vehicle or safety systems, but at least the clock is started. chamber. It failed by buldging in, but no where near as bad as the earlier failures. It bulged in exactly inline with the igniter outlet. So maybe the torch igniter is softening the chamber wall. We are goign to try a number of fixes for this this again this weekend. Three expeditions to Mojave in three weeks is a bit hard on the sleep schedule. Tonight I made a chamber liner by silver soldering it at high temperature. In my pressure test fixture it failed between 380 and 400 PSI. So this explains my motor failures, but does not really give me a huge amount of comfort. It means I can never get the liner hot enough to anneal it and I am Dependant on the annealed condition of commercial water pipe for my strength. We are going to test fire again the weekend. Simulating Chamber failure at home. Any time I can run an experiment at home that replicates things I see at the test site it's a huge win. Tonight I fabricated a plugged injector plate and soldered up a chamber inner liner and throat. I used the plugged injector plate to Hydro test the chamber to failure. The chamber liner failed at 1750 PSI. It failed in exactly the same way as the chambers that failed in the field did. This liner and throat were soldered with normal relatively low temp solder. Thursday I will solder up a throat with high temp silver solder and test that to failure. As part of doing this test I also abused my o-ring seals, no lubricant and hammered them together. I even got o-ring slivers sliced off the injector end o-ring. Still the o-rings held and did not leak at 1750 PSI.The Snap ring retainers and the fuel feed plumbing also held the pressure. All in all a good test. For one last reality check Plain old un alloyed copper has a work hardened to fully annealed yield strength ratio of ~5. So 1750/5 = 350PSI we were running the fuel feed at around 375. At some level it all makes sense. This weekend we had two chambers fail identically. We set out to verify we had solved our ignition problems. So for our first test we ran a few seconds , purged a few seconds and ran again. Both ignitions were perfect. On the second start we saw a big green copper flash. We thought this chamber failure was due to too short of purge. But in reviewing the video I see we got a green flash on shutdown. We ran a second motor and it failed on startup. The first chambers we built we used high temp silicon to seal to the carbon throat and had the spiral wires soldered on with normal solder. The chamber to aluminum jacket tolerance was so tight we had to assemble the motors with a sledge hammer. The motor we ran for 106 seconds had the copper throat soldered into the chamber wall with normal solder and spiral wires soldered on with normal solder. This motor was tight, but only needed light taps, not the full sledge treatment. When we disassembled that motor we discovered that some of the spiral wires were loose, we did no know if that was an issues with getting hot of breaking the wires loose on assembly / disassembly. As a result we decided that we should silver solder the parts together. So the last two motors we built with silver solder. This requires that we get the copper liner much hotter and probably removes the temper. 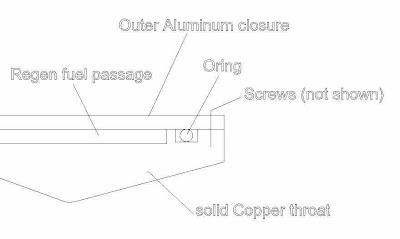 As we have been using copper water pipe the temper is a side effect of the forming process and is not guaranteed to be in any particular state of hardness. We are softening the chamber walls when we silver solder the parts together. The Hotrod igniter is making a soft spot on the chamber side leading to local buckling. We got a different batch of water pipe and is is less tempered. Switch back to normal solder for the throat and spiral wires. 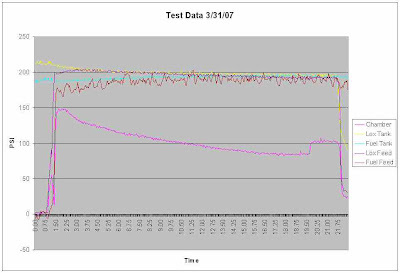 Rerun our flow rate tests we ran on the first chamber to verify we have not drifted off of nominal. Do a hydrostatic collapse test on the pipe we have to see if the batches are different. Build up 4 chambers for testing, hopefully, next weekend. One of these chambers will use thicker pipe wall. Run a test where we run the igniter and then hit the chamber with full fuel pressure, but no lox if this collapses then we have the igniter too hot or oriented wrong. Rerun the tests we tried this weekend. If both of these fail retest with the thick wall chamber. The game was not even close, Murphy won. 1)Saturday Afternoon Very little lox, almost none. Masten Space was nice enough to sell us some of theirs. Melted the test chamber in a new way. Video and pictures Monday. 3)Late Saturday set up telescope. One axis is broken and drive motor makes grinding noises. Used it in manual mode looked at moon and Jupiter, very cool viewing. 5)Sunday noon time...Tested 2nd chamber failed immediately with the center copper chamber wall buckling and collapsing inward. Same failure as #2 above. 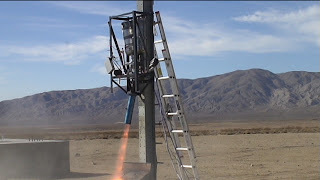 6)Sunday just after noon help SDSU students with telemetry for their rocket. 7)Early Saturday Successfully flew my RC helicopter. Saturday Afternoon flew it again, tail rotor belt failed. Failed in low hover, no other damage. 8)Sunday about 3:30 got flat tire. Spare was flat. The road to the test site is rock and dirt, very hard on tires. Murphy 8 unreasonable rocketeers ZERO. No one was physically injured, when I got home the house had not been leveled by a stray meteor, its all part of the process. I've just received the first Unreasonable Rocket Tee's and they look good. So feel free to order some at the Store. 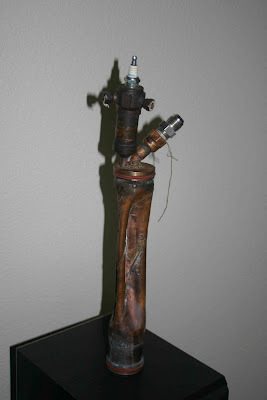 I brazed my last injector myself, but it got really oxidized. I was worried about the black oxide flakes plugging up the injector. So I thought I would step up to the plate and have the next one furnace brazed. So I did about 30 hours of machining making all the parts and took it to a company that specializes in furnace brazing. As I did it all myself I had the peice part drawings, but did not have an assembly drawing. The parts only fit together one way. Unfortunately the person doing the work was not the person I presented the parts to. The person I presented the parts to came from the shop end of the building so I figured he would be doing the work. I got it back today and the gap between the pintile and injector plate is brazed shut. $200.00 of telerium copper and more importantly 30 hours of work are scrap. Argggh! Key learning point.... If the shop is used to detailed assembly drawings provide them one. Even if it is self explanatory to you it may not be so to them. I've just finished printing the two copies of my experimental permit application. I'm on my way out the door to send them. As I've stated previously I would make anything I formally submit available. Here is the Application and the Cover Letters. I'm a tiny bit queasy making all of this public, but one of my main goals is to try to demystify the process of doing rocketry as much as possible. The regulatory aspects are a key part of that process. I got a chance to chat with my AST representative today and I'm pleased with the discussion. He indicated that I should probably formally submit my next revision and not just send them a draft for review. While not a formal endorsement, it at least implies that I'm close to "complete enough". I hope to finish up and Mail the Fed-X the formal application on Monday or Tuesday. In a past life I was responsible for negotiating the technical engineering aspects of a significant subcontract. whenever we found ambiguity in the contract it was good news because we could exploit this to get more money from the prime. As a result I have a fine tuned "ambigious nit sensor". I have to fight this impulse to pick these nits when working with the FAA. AST understands that there are no hazardous materials asociated with the vehicle. However for the purposes of documentation completeness, the application still needs to state positively that there are no hazardous materials used in the suborbital rocket. Is the Lead in Brass Hazardous? 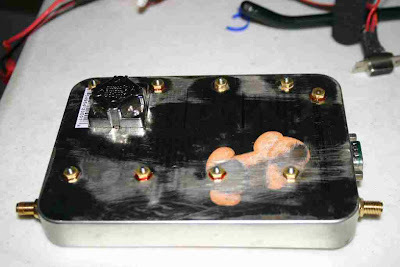 Is the gallium arsenide in the GASFET RF amplifiers hazardous? Unreasonable rocket will not be using any environmentally hazardous substance, we are only using benign non-toxic propellants . The non- consumable portions of the vehicle will be constructed with aluminum,copper, stainless steel and normal composite structures. The only components of vehicle that might contain nominally hazardous materials are the trace elements in the electronic components and lead containing solders that are part of these assemblies. The commercial components will all be RHOS compliant lead free, but the non commercial components assembled for this effort will use lead solder for reliability purposes. Unreasonable rocket is not using any hazardous consumables. Our test stand used flight weight tanks and valves. Our first vehicle is going to look a lot like four of these test stands. We had Thunderbird Water jet cut some valve parts and brackets. We ordered and received a batch of tonegawa servos from Tokyo hobbies. Tube services sold us some aluminum tubing to make tanks. We ordered all the tank weld on AN fittings from Iindustrial liquidators They are a dealer for Earls Fittings. Lots of Valves, snap rings and parts from McMaster Carr. I have enough Tellirium Copper to build 20 or so Motors purchased from Cambrdige Lee. 3 Vehicles of solinoids from Predyne. 1.25 Vehicles of ignition modules from CH-Ignitions. 2 Vehicles worth of Composite helium tanks on Order from SCI. 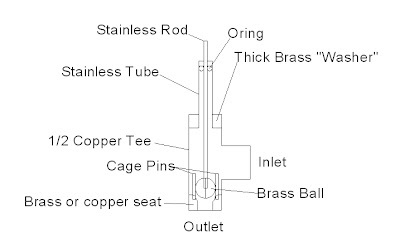 On Friday I pick up a furnace brazed Injector assembly from Certified Metal Craft. I'm sure I've left off and forgotten a million vendors. Buyer Beware I have not yet seen this printed on a Tee shirt. the blog with a good/bad review later this week when they arrive. On Monday I flew to DC to meet with AST to discuss my draft experimental permit application and to attend the Experimental Permit workshop. After this series of meetings I'm feeling pretty good about the paperwork side of the process. AST did not ask for anything that was at all unreasonable. The comments to my draft application were entirely reasonable and I'm very hopeful that my next submission will be judged as "Complete enough" to start the 120 day permit clock. Now back to actually building a vehicle capable of competing. While I was in DC I went to visit the Aerospace museum. It was really sad that the only launch hardware advances in the museum newer than 35 years old was Spaceship one. We made incredible advances in the 50's 60's and early 70's, since that time we have done nothing to extend that legacy of development. What we have instead is an entrenched NASA bureaucracy striving to get funding for a development boondoggle of biblical proportions. Increased the orfice sizes raising the igniter chamber pressure from 80 to 160 PSI. Changed the check valves to metal seat check valves and moved them closer to the igniter. Added a sintered fuel filter to keep from plugging the fuel orfice. Changed the orifices from steel to stainless. After verifying all of these changes with some igniter tests using GOX/Ethanoal I fabricated a new injector and chamber assembly. I also took Sunday the 6th off and went up to help Kevein weld on the Large vertical test stand. It was a really busy week, we finished up and headed to the test site about 19:30 on Friday. 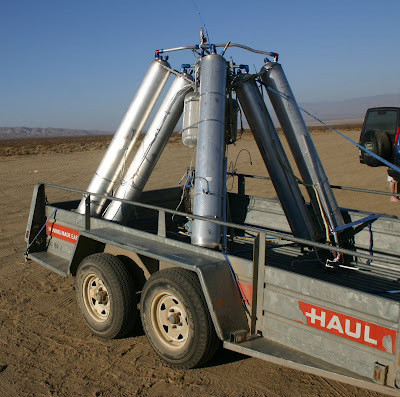 We have been bringing our own LOX out to the test site, but this time we were bringing two barrels of Ethanol and did not want to carry both on the highway at the same time. So we had the LOX delivered. We arrived at the test site about 00:30 Saturday morning. As we unpacked and got ready to camp we noticed a loud hissing noise and discovered it was the lox dewar venting, It was completely empty. The short version is no LOX no testing. On Monday the 14th I fly back to DC to talk to the FAA about my experimental permit and to attend the experimental permit workshop. I'ts been 4 weeks since I last offered an update. We have been testing every 2 weeks, two weeks ago we went out to test with the goal of improving our ignition reliability and doing some throttle testing. After reviewing the data from our earlier test series we learned that the fuel and LOX pressures were not coming up evenly to the commanded start position. The end result is that we tried to start at idle and then powered up to full throttle. We probably did this before the chamber was 100% lit causing harder starts. So we modified the software to change this sequence and went out to try again. The only physical change to the motor was a change from bolted to snap ring closures on the motor. We tried to start the motor 4 times with only one successful light. After the first two failures to light we changed the software back to its origional condition and tried a third time, still no light. So some diagnostics showed that the igniter fuel solenoid was dead. We replaced that and tried a fourth time. We did not switch the old software back to the new so for the forth attempt we successfully lit the motor but it started a bit hard. At this point we were suffering for the 3 failed attempts as we were running low on presurant gas. The video camera had also been running for more than an hour and it gave up the ghost so we got no video of the 4th run. 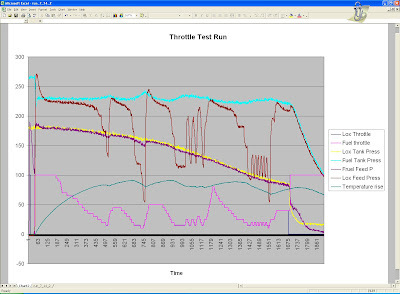 The 4th run was a 30 second throttle test. and did its throttle steps for another 10 seconds or so. This chain of events is pure speculation based solely on the visual state after the run and the data we collected. When we returned home and disassembled the motor we also determined that the injector plate was bent. Saturday we fired the 250 Lb motor with a new all copper pintile injector. The top end of the motor and the chamber wall worked fine. The Throat/end closure leaked and we melted the bottom end of the motor. It ran for 24 seconds, but the video camera died 20 seconds into the firing. The video is here. After looking at the data, the chamber pressure started declining almost immediately, so I think the throat was coming apart as soon as we started. We still did not get any load cell data, the load cell worked in the shop, but not when the rocket was running. We have gotten this result twice. The Fuel feed pressure was also very noisy. In the chart below the Tank pressure sensors measure the tank pressure and the feed measures the pressure at the input to the motor after the throttle valves. 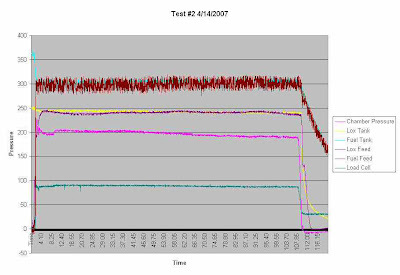 At the end of the run the Lox tank and feed pressure drops quickly as we vent the tank, but the fuel pressure does not seem to change much. 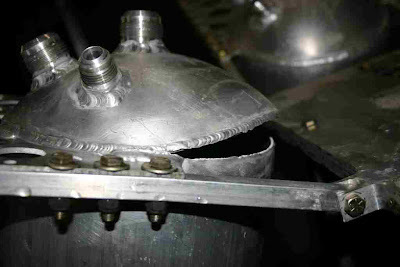 This is because we vent the fuel tank utalage into the motor for purge. 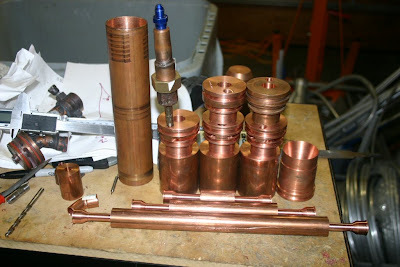 We will make a solid copper throat/chamber assembly and either test next weekend or the following week. It will depend on if I can find a 1st class Pyro op for this coming Saturday. Today I started seriously looking at the paperwork necessary for my AST license. It seem like an appropriate day to start ;-) I wrote the beginnings of a hazard analysis and started looking at the procedures and verification processes necessary. Toward that end I also made a slightly more accurate rendering of the vehicle. The testing went well on Saturday. We fired 1/4 of a vehicle. We had some software sequence problems that caused it to start roughly but we ran it for 16 seconds with no burn through or other damage. Sunday we disassembled the motor and analyzed the data. There is good news/bad news. Good news, the regen motor shows no signs of melting. The bad news is we looked at the data and the presurization problem was more severe than we thought. We never got up to operating pressure. The operating pressure is supposed to be 80 to 250PSI we ran it from 40 to 120 during the test. So we did not run it anywhere near full throttle. 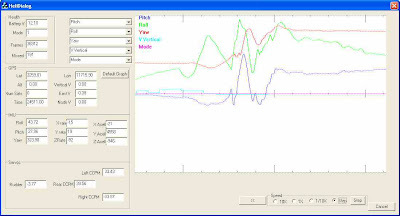 This is actually useful data as it shows the engine is stable at low feed pressures, all the way down to 50 PSI. We got no load cell data. We also fired the 650 Lb Ablative we tried to fire a few weeks ago.